We use a combination of radar and lidar observations and radiative transfer models to deduce the properties of clouds and to understand their role in climate. This page provides a narative to our completed work and the numbers in parentheses refer to papers on the publications page. For an overview of some of our ongoing projects, see the Clouds Group home page. Most cloud remote sensing techniques infer cloud properties from measurements of the natural radiation emitted or scattered towards the instrument. While the horizontal coverage can be excellent, particularly from space, these "passive" measurements tend to have poor vertical resolution. Cloud radar is an "active" instrument which rapidly transmits microwave pulses into the atmosphere, and by accurately timing the returned echos it can map the vertical structure of clouds with much higher precision. Cloud lidar works in the same way as radar but uses laser light. We make extensive use of the cloud radars and lidars at Chilbolton in Southern England. As clouds are blown across the instruments, two-dimensional cross-sections are built up. An example from a cirrus cloud with distinct fall-streaks is shown below. A photograph of a similar cloud is shown alongside. The principal challenge is to convert the raw measurements that the instruments make into something useful like average particle size and cloud water content. This is possible by combining the measurements from two different active instruments. 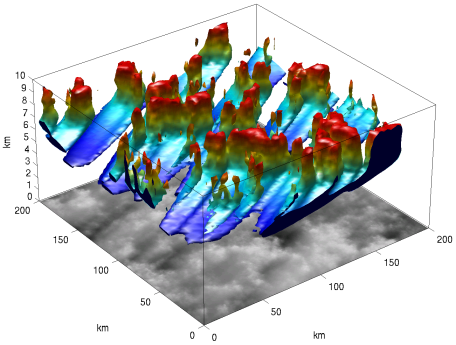 Combined radar-lidar algorithms have been developed to obtain ice cloud properties (7,18,28) and drizzle properties (19). Likewise, dual-wavelength radar algorithms have been developed to derive ice cloud properties (1,4) and liquid water content in stratocumulus (20). Simpler methods are possible if only one frequency is available, such as using radar reflectivity and temperature to obtain ice water content (27). We are now adapting these methods for use from space. The first ever space-borne cloud radar, CloudSat, was launched in 2006 by NASA, was accompanied by the "CALIPSO" lidar and numerous passive instruments on the "A-train" of satellites flying in close formation. The European Space Agency has approved the "EarthCARE" satellite for launch in 2013, which would carry cloud radar and lidar on the same platform. A novel variational radar-lidar-radiometer retrieval algorithm has been developed for use from the ground or from space (51,65). As part of this work, computationally fast lidar and radar multiple-scattering models have been developed (29,46,47). Current weather forecast and climate models split the atmosphere into boxes typically measuring 50 km horizontally and 500 m vertically, and diagnose the fraction of each box that is cloudy. The simplest use of radar and lidar data is to determine the location of the clouds and verify model forecasts of cloud fraction over the site. This has been done for the ECMWF model (6). The 10-day comparison below demonstrates that the larger scale features are captured reasonably well but there are differences in the detail at smaller scales. This work has been taken to a new level in the Cloudnet project, in which cloud fraction, liquid and ice water contents have been evaluated in seven European models and three sites (34). Cloud radar can be attenuated in rain so we have used the lower frequency weather radar at Chilbolton to evaluate the ice content above precipitation in the Met Office model (23). We have also used the space-borne ICESat lidar to evaluate clouds in the ECMWF model using a lidar forward modelling approach (42). We have recently applied our variational radar-lidar retrieval algorithm to CloudSat and CALIPSO observations (65) and evaluated the global distribution of ice water content in the Met Office and ECMWF models (72). The results in the figure below demonstrate that the Met Office model gets the average about right for a given temperature, while the ECMWF model has an unphysical "cut-off" where ice cloud is converted to snow and falls out instantaneously. The new ECMWF scheme with prognostic snow overcomes this problem. Even if the cloud fraction were perfect in the model, the forecast of cloud "cover" (the fraction of the surface that has some cloud above it at any level) depends on the degree to which the clouds in each level are overlapped. Most current models assume that clouds in adjacent levels are maximally overlapped, while clouds separated by entirely cloud-free levels are randomly overlapped. Analysis of cloud radar data shows that clouds in adjacent levels are more randomly overlapped than previously thought (3), which has serious implications for predicting cloud cover. 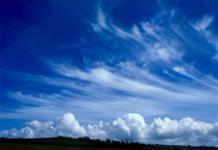 One also has to consider the difference between cloud fraction defined by area and volume (24). Newer models are beginning to predict the structure of the cloud properties within each box, which is important for the interaction of solar and infrared radiation with the cloud. We have used radar to derive the important cloud variability and degree of overlap of cloud inhomogeneities for ice clouds (10). We have recently developed a new method "Tripleclouds" for representing both cloud inhomogeneity and accurate overlap properties in model radiative transfer schemes (44) and used it to estimate the effect of cloud structure on the global radiation budget (59,60) as well as implementing it in a free-running climate model (70). A technique has been developed to generate realistic 3D cirrus cloud fields based on observed power spectra taken from cloud radar observations. This has enabled the radiative effects of cirrus to be calculated as a function of wind shear, which strongly affects the orientation of the cirrus fall-streaks (21). An image of a fractal cirrus cloud generated by our stochastic cloud generator is shown below (see also the Intercomparison of 3D Radiation Codes page). Three-dimensional radiative transfer calculations have been performed to determine the radiative impact of horizontal photon transport in stochastically generated cirrus clouds (41). Similar calculations for aircraft contrails reveal that their net radiative forcing, and hence their effect on climate, are strongly dependent on the inclusion of horizontal photon transport (39). Mixed-phase clouds are those that contain both ice particles and supercooled liquid droplets, and can occur between 0°C and -40°C. Whether a cloud is composed of ice or liquid is crucial for determining how much of the incoming radiation from the sun it reflects back to space: liquid droplets tend be smaller and far more numerous than ice crystals and so a liquid cloud tends to be around 10 times more optically thick than an ice cloud with the same mass of condensed water. However, a lack of good observations means that representation of mixed-phase clouds in models has tended to remain very crude. The strong reflection of sunlight by liquid water clouds means that they also give a strong return to lidar. 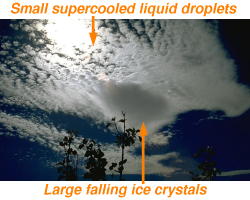 The figure below shows typical data in altocumulus from ground-based lidar, in which ice crystals can be seen falling beneath a very reflective layer indicative of supercooled liquid water droplets. A photograph of a similar altocumulus is shown on the right. The weather radar at Chilbolton has a 25-m dish, which enables it to probe storm clouds with unparallelled resolution. A new variational method has been developed to use the polarization capability to derive rain rate and hail intensity with more accuracy than has been possible until now (35). The Doppler capability has been used to derive the convective mass and momentum fluxes in a line of cumulonimbus clouds (45). A volume scan of the storms is shown below.